The following items are available in addition to our artisan pizza buffet. We use in season, locally produced items when possible. Dip and Spread Choices – All dips and spreads are house made – Salsa Di Parma, Spicy Feta, Hummus, Roasted Red Pepper, Spicy Chipotle, Drunken Figs with Goat Cheese, Sweet Maple (served with apples), Artichoke and Arugula, Fresh Herb Goat Cheese. We use the finest ingredients available for our pizzas. We make our own dough, sausage and sauces, and source products through local farms and businesses when possible. Our pizza buffet starts at 15.00 per person, with the choice of four pizzas. Our pizzas are named after famous wanderers. Who is your favorite? NEIL ARMSTRONG – House tomato sauce, fresh mozzarella, extra virgin olive oil, fresh basil and French grey seas salt. MARCO POLO – House tomato sauce, house Italian fennel sausage, shiitake and portabella mushrooms with a mozzarella/provolone blend. DORA THE EXPLORER – Our kids pizza! House tomato sauce and a mozzarella/provolone blend. JAMES T KIRK – Garlic infused olive oil, maple roasted sweet potatoes, pancetta, bleu cheese with a four cheese blend and a maple syrup drizzle. HUCKLEBERRY FINN – House tomato sauce, Volpi artisan pepperoni, house seasonings with a mozzarella/provolone blend. ANN BANCROFT – Garlic infused olive oil, roasted duck, red onions, roasted red peppers, broccoli with a mozzarella/provolone blend and a creamy chipotle sauce. DR WHO – Garlic infused olive oil, pancetta, roasted red pepper, red onion, fresh spinach with a four cheese blend. ROSIE SWALE-POPE – Herb cream sauce, roasted chicken, roasted red peppers, fresh arugula with a mozzarella/provolone blend. CHARLES LINDBERGH – Fresh pesto with roasted red peppers, Kalamata olives, artichokes, feta cheese with a mozzarella/provolone blend. DON QUIXOTE – House fig sauce, prosciutto, bleu cheese, fresh arugula with a mozzarella/provolone blend. INDIANA JONES – Extra virgin olive oil, house smoked pulled pork, pepperoncini, house pickled carrots and onions, pica pica seasoning with a mozzarella/provolone blend and creamy mustard sauce. Contact us about developing your own signature pizza! Iced Organic Sencha Green Tea with berries. Sweetened. Services included in above pricing – Your choice of 4 pizzas, plus a plain cheese pizza, all set up and tear down, buffet tables with linens, serving items, high quality compostable plates, napkins, disposable silverware (for salads or soup), garbage receptacles and removal, and clean up. Distance – For service locations with a standard drive time of over 55 minutes from our home base, a distance fee will be assessed. Distance fee will be calculated based on drive time, actual mileage, and number of staff at event. $100 Minimum. Distance fee calculated at time of proposal. Plate Upgrade – Bamboo or Palm Leaf plates may be substituted for standard compostable paper plates for any part of service. 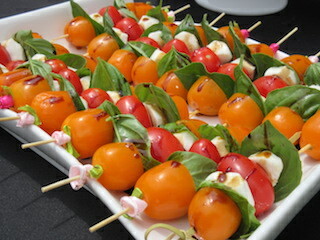 .50 per person for appetizer, salad or dessert (each), .75 per person for dinner plate. Recipe Development – A Wandering Fire will develop a signature pizza just for your event. Additional Staff/Hours – In certain circumstances, additional staff or longer than standard hours are required. For instance, if the buffet location is away from our set up location and a runner is required, or the venue requires us to be on scene earlier than is needed for set up. $75 Minimum. Cost estimated at time of proposal.